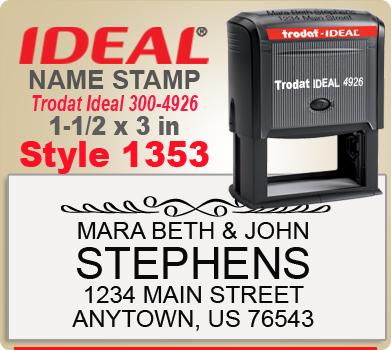 Creative Name Stamp Rubber Stamps are produced using Trodat Ideal 80 4912, 100 4913, 200 4914, 300 4926 and 400R Self Inking Rubber Stamps. Simply enter your Name in the proper field, your Address and then your City State Zip. 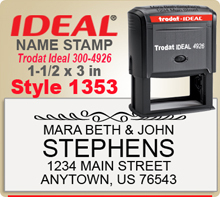 These Name Stamp Rubber Stamps are created so precise it is not suitable to create them online at this time. However Creative Name Stamps will look exactly like the example here except your lines may be a little longer or shorter. The creative element, the swirl or other art element will appear just as you see it here in the Name Stamp example. We hope you enjoy your very unique Name and Address Inked Rubber Stamp. Click the larger image button at left and you can really see what your product will look like.